Okay, so I think this is THE post all you guys were waiting for eh?! Well here it is- your updates on the Marvel Anime projects! I ain't gonna be recapping on any info so I suggest you read this first! :P Of course my main focus is gonna be on the Wolverine & X-Men anime shows, but I'll certainly talk a bit about the Iron Man & Blade ones too (we Marvelites gotta help each other!). 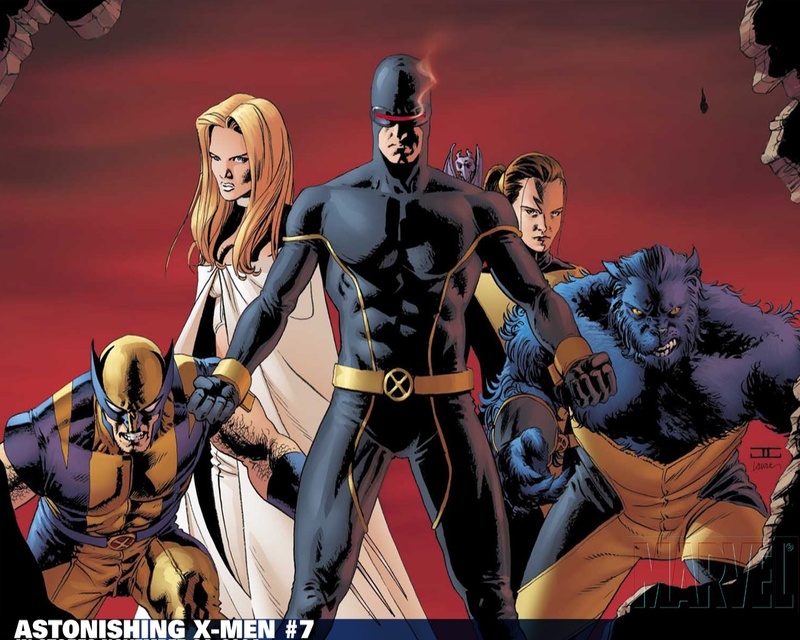 ^Wolverine unsheathes his claws & the X-Men anime cast (not including Emma Frost). Hisako Ichiki is a student of Frost in the series. As the title suggests, all the info is courtesy the San Diego Comic Con 2011! (If you just came on my blog & are like "Huh? Say what?!" read this & this!) Don't forget to download the various videos that are sprinkled all over this post! Like this first one- the G4 trailer for all the four anime shows! *All the shows are gonna be independent of each other. So expect NO storyline tie-ins between them. However DO expect character-crossovers, cos Wolverine IS there in the X-Men anime (duh!) albeit in a much older look, & he also appears in the Iron Man anime! Get your first peek of the voices of Heroes' stars Adrian Pasdar & Milo Ventimiglia as Stark & Logan in this video snippet! 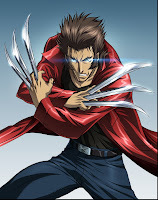 Yup Wolverine in the Iron Man anime show! AND I'm changing my stance- Milo is GREAT as a younger version of Wolverine in the series!! *All were written by Warren Ellis along with Madhouse. *Jeph Loeb stated that the four shows are "not anime versions of Marvel characters, but our characters with an anime look & feel." *Iron Man & Wolverine have already debuted in Japan (in fact, subbed versions of both shows have come online too) & they are putting together the English versions which will air on G4. *The Wolverine (& Iron Man) debut which was scheduled for July 29 (at 11pm on G4) has ALREADY reached your TV & computer screens (in the US) last Saturday (check right>>)! Yup, if you missed it, the first episodes of Iron Man & Wolverine aired on July 23! *The show can get a weee bit R-rated! (Which is ALWAYS a good thing!) Loeb cautioned parents to get the kids outta the room as this "skews more adult" & has some "kickass violence"!!! -Omega Red was the villain featured in that particular episode! AND he looks badass! -Backstories of characters get revealed through flashbacks (even in-between the fight-scenes)! -In one flashback, Yukio comes on the scene! Yukio, a Japanese female ninja, was a supporting X-men character ever since first appearing in Wolverine #2. In the anime, she is Logan's ally & has got a cool array of weapons! *It will be the next in line to be released on G4! *The look & feel is inspired by Joss Whedon (who also happens to be The Avengers director!) 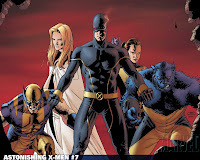 & John Cassaday's Astonishing X-Men (<< check left). Trust me, this is DEFINITELY a good thing! *Cyclops will be the center of the story & is voiced by (self-proclaimed Marvel fan) Scott Porter. If you recall me telling you guys, he's the same guy who's voicing Adrian Luca in the X-Men Destiny game. Seems like he's now joining Milo as another staple on Marvel's Fave Voice-over Actors list! Now a bit on the Blade anime show...The music is also on par with Wolverine's. And the footage aired featured vampire rats!! Now that's gotta be cool! :P Expect Blade casting news to be announced in the near future! Check the (Jap) trailer below- bearing that Japanese narration is the price to pay to get your first look at Deacon Frost in the show LOL! My main source for the updates you read above was the nifty live-blog at CosmicBookNews! Check it to get an almost blow-by-blow account of the Wolverine ep that was aired! Lastly, the Iron Man anime! This review for the first ep gives it a B+! Looks very promising...Didn't read the review cos it's full of spoilers :P And personally I am REALLY digging the music for this show EVEN MORE than the Wolverine one! Check it's (Jap) opening creds below, compare & tell me if you agree! Are they making astonishing x-men into a tv show. No plans for a TV show, but AXM Gifted is already a motion comic & the next Whedon arcs are planned to be the next.